Scientists have for the first time found a piece of amber containing a snake dating back about 99 million years to the age of dinosaurs. 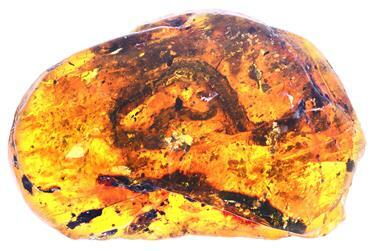 The skeletal remains of a prehistoric snake are seen in an amber found in Myanmar. A group of scientists from China, Canada, the United States and Australia discovered a small baby snake, belonging to a previously unknown species, preserved in a piece of amber from the Hukawng Valley, in north Myanmar’s Kachin State. “We found the remaining skeleton in the amber is 4.75 centimeters long. But we infer that some bones are missing. So the total length of the snake might be about 9.5cm,” said Associate Professor Xing Lida of China University of Geosciences. Scientists concluded the snake was a previously unknown species. “Compared with other fossilized vertebrates, snake fossils are very rare because the bones of most snakes are not very hard. It’s not easy for them to become fossils,” Xing said, adding that most common fossils cannot preserve the soft tissues of ancient animals, but amber, formed by resin, can better conserve soft tissues and bones. In another piece of amber, researchers found a part of snakeskin with circular patterns. They believe this came from a forest predator, probably 60 to 70cm long. Scientists believe snakes might have evolved from a kind of lizard. The earliest snakes can be traced back to the mid-Jurassic Period. Fossils of an ancient snake, Eophis underwoodi, dating back 167 million years, have been found, but they are in fragments and can offer little information. During the early Late Cretaceous from 100 million to 95 million years ago, snakes roamed all over the world. Most snake fossils, uncovered in Southern Europe, Africa, North America, Middle East and South America, had no forelimb, and some had small, useless hind legs, said Xing. Most of the fossilized snakes found previously show they lived in water. This is the first discovery of a snake living in a coastal forest of the Mesozoic era, indicating that early snakes lived in a more diversified environment, Xing said.